It has come to my attention after thirty years as a psychoanalyst and psychotherapist that spouses often disagree about parenting styles. This leads to arguments that can be quite intense and last many years during their parenting lives and creates loyalty conflicts in their children. Two parenting styles that collide are the spouse who is more dictatorial and believes fear and intimidation are required to get kids to listen to them. On the contrary, the other spouse is more gentle, lenient, and empathic about setting rules and compromising with their kids. When it comes to chores, curfews, cleaning up messy rooms, consenting about requested material goods or various activities, the parents go head to head, mostly in front of the kids. The kids feel the tension and strain and react in various ways, clearly preferring the more lenient parent. The dictatorial parent generally feels he or she is right and his or her way should not be questioned or there will be a punishment like by taking something away from the child or teen. The kids’ responses vary from listening and resentfully accepting the punishment to sneaking around and lying about what they are doing to avoid the wrath of this dictatorial, parent or taking the punishment ostensibly like accepting something taken away, only for it to be returned by the other more lenient parent. Loyalty conflicts also ensue with regard to which parent to listen to. The end result is the children tend to not only disrespect their parents, but they don’t learn about collaboration, thinking through decisions, and compromise essential skills to learn as one grows up. As this continues over the years, the marriage breaks down considerably often resulting in chronic arguments, the silent treatment by one spouse, and potentially divorce. Often however divorce is not entertained because outside of parenting, the dictatorial parent often has a warmer side that appears when there are not disputes and he or she lovingly cares for and listens to his or her spouse and kids under less stressful circumstances. The Parental Intelligence Way seems to be an avenue such parents can agree to and co-parenting can begin. This is a skill set of 6 steps that help parents refrain from reacting too quickly with consequences before they understand the problem presented by the child. The jist of the approach is that parents need to understand the meaning behind the child’s behavior, anxiety or anger, two of the most frequent powerful emotions. Without understanding what is on their child’s mind when they feel or act a certain way, how can they deliberate reasonably about solutions? The first step is STEPPINT BACK which means doing nothing at first except the parents talking to each other about what they observe the child saying or acting out. Slowing down in this way induces a calmer, nonjudgmental stance by both parents. For example, a ten-year-old girl comes home very anxious and scatters her homework on the kitchen table. Dictator spouse may tend to yell at her to clean the mess and start her homework which results in tears or stomping away. The lenient spouse may tend to offer to help straighten up the mess and help with the homework. This starts a marital dispute and the anxious child is left uncared for. By STEPPING BACK both parents refrain from acting and just talk about what they observe. The second step is SELF-REFLECTING where each spouse shares the feelings they have in response to their daughter’s anxiety and mess. The dictator spouse is usually angry and the lenient spouse is more on the worried side. Sharing their feelings with each other slows them down from over-reacting in any way and helps them calm themselves down before approaching their child. The third step, the most crucial, is UNDERSTANDING YOUR CHILD’S MIND. This means the parents talk to their anxious daughter about what is the matter. They ask her what is wrong that she is in such an anxious state. She shares, for example, she was cut from the lacrosse team and fears losing friends with the popular kids and not getting a scholarship to college in the future. Now both parents know what’s on her mind and why she is acting so anxious and scattered. They can consult each other about what should be done. Co-parenting is now taking place. It’s likely that either parent would at this point console their daughter pointing out that she is way ahead of herself to be worried about college. Either parent may naturally comment that her grades are good and she’ll have many opportunities for activities in the future. Using step 4 of Parental Intelligence, UNDERSTANDING YOUR CHILD’S DEVELOPMENT, these now co-parenting spouses realize their daughter worried way too far ahead of her age and has trouble just enjoying being ten! 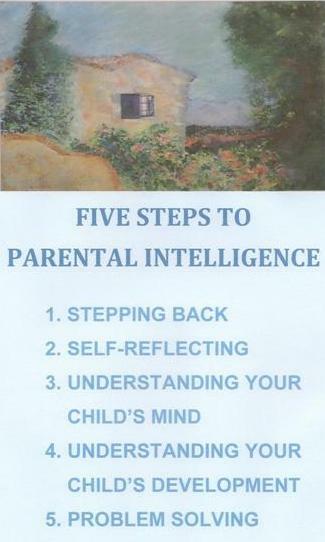 This consensus between the co-parents leads them to the 5th step of Parental Intelligence: PROBLEM SOLVING. They ask their child what she want to do about being cut from the team in order to encourage her thinking and reasoning to curb her anxiety. Being listened to in this way results in her anxious panic subsiding. She admits she was close to having a panic attack, sweating, trembling, feeling dizzy and now that her parents seem on her side, these physical symptoms subside, and she can think. She suggests that she can try out for the team again next term and admits that her parents’ perspective that she is looking too far ahead has calmes her down considerably. Thus,co-parenting with the 5 steps of Parental Intelligence lead to a stronger bond between their daughter and mother and father leading to a greater sense of security, lowered anxiety, and respect for such reasoning, caring parents. This may seem too ideal for such disputing parents, but in my experience it gives them a skill set they can share to solve parenting disputes that lead to marital conflict. To read more about this approach go to several books on Amazon, Barnes and Noble, and wherever books are found: UNLOCKING PARENTAL INTELLIGENCE: FINDING MEANING IN YOUR CHILD’S BEHAVIOR, THE BUSY PARENT’S GUIDE TO MANAGING ANXIETY IN CHILDREN AND TEENS: THE PARENTAL INTELLIGENCE WAY and THE BUSY PARENT’S GUIDE TO MANAGING ANGER IN CHILDEN AND TEENS: THE PARENTAL INTELLIGENCE WAY.